Thanks for the mention and the reference, Dr. Debs! All three of the wines are very lovely! 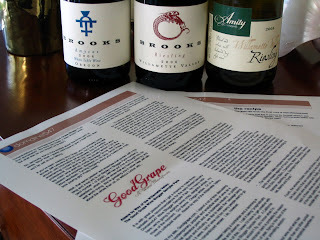 Brooks is one of the most under-noticed wineries and meritorious of much wider attention and Amity is something of the grandfather winery in the Willamette Valley. All of the wines in the Good Grape Pack are really, really enjoyable wines. Alas, I wish you could make the crab dip for the Colts in the Super Bowl, but we know that's not going to happen again this year! With or without the Colts, the crab dip is a welcome addition to my kitchen arsenal, Jeff. And I'm looking forward to trying one of the bottles out in the next few weeks.